Sparrow Blend No. 23 Green (Menthol) Pipe Tobacco, is made of a nice aged ribbon cut premium tobacco with just the right touch of Cavendish for the filler, making them deliver a superb smooth smoke every time. Sparrow is blended with a perfect balanced of a low flavor intensity with a mellow smoothness that keeps smokers coming back for more and more. Domestically grown in the USA. 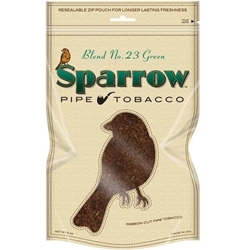 Sparrow Pipe Tobacco is made of a nice aged ribbon cut premium tobacco with just the right touch of Cavendish for the filler, making them deliver a superb smooth smoke every time. Sparrow is blended with a perfect balanced of a low flavor intensity with a mellow smoothness that keeps smokers coming back for more and more. Domestically grown in the USA, Smokers Discounts offers this great brand at a low discount price!